group | nb of | nb of | mean / max of | records | unique | records per records | in group | QNAMEs | unique QNAMEAll records........................ A | 1800 | 1800 | 1 / 1 o template has single segment.... S | 1800 | 1800 | 1 / 1 o template has multiple segments. M | 0 | 0 | NA / NA - first segment.............. F | 0 | 0 | NA / NA - last segment............... L | 0 | 0 | NA / NA - other segment.............. O | 0 | 0 | NA / NA Note that (S, M) is a partitioning of A, and (F, L, O) is a partitioning of M.Indentation reflects this. group | nb of | nb of | mean / max of | records | unique | records per records | in group | QNAMEs | unique QNAMEAll records........................ A | 204355 | 190770 | 1.07 / 10 o template has single segment.... S | 204355 | 190770 | 1.07 / 10 o template has multiple segments. M | 0 | 0 | NA / NA - first segment.............. F | 0 | 0 | NA / NA - last segment............... L | 0 | 0 | NA / NA - other segment.............. O | 0 | 0 | NA / NA Note that (S, M) is a partitioning of A, and (F, L, O) is a partitioning of M.Indentation reflects this. 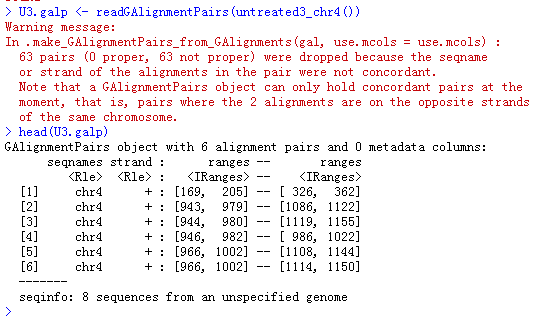 This entry was posted in R and tagged bioconductor, GenomicAlignments, R by ulwvfje. Bookmark the permalink.